I still haven't had a chance to personally examine this book but from what I've heard from literally everyone who has, including people I highly respect, this book is one of the top five jazz piano books out there. Pianists all know the benfits of playing the Two-Part Inventions of J.S. Bach. Now, world-respected jazz pianist and composer Bill Cuncliffe has written his own "inventions"" that will benefit every player's understanding and performance of jazz. 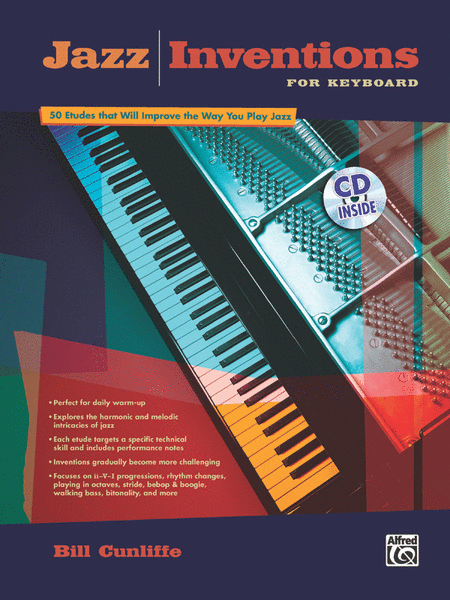 These great-sounding etudes explore the specific harmonic, melodic, and technical, challenges faced by jazz keyboardists, includdeing the ii-V and ii-V-I progression, outlining changes, chord-tone ornamentation, playing octaves, tonic patterns, block chords, polytonality, stride piano, and left-hand walking bass. This book is better than Mark Levine's Jazz Piano Handbook, as it is practical and gives you real applications of jazz theory. Working through it slowly will give you the fundamental skills in jazz piano playing from ii V I (major/minor) to basic scale theory, block chords, turnarounds..., etc. Highly recommended.